Determining Portable Class Library compatibility | | I lost 55lbs using these two amazing simple steps–you can too! Before Windows Live Writer was even publically released, I was glad to have been an early beta user/tester of the product. The team thought early about an extensible model and it has been my content authoring tool ever since. It has allowed me to use *my* preferred content workflow with my cloud providers/formatters/tracking and other such plug-ins due to this extensibility. 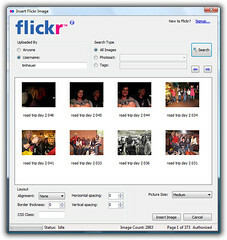 One of the first plugins available was one of mine I called Flickr4Writer. It was pretty popular (as most ‘firsts’ are) and I got a lot of good feedback that changed the functionality and user interface. Is it the best design/code? Probably not, but it seems to have served the needs of many folks and I’m happy about that. I put the code into the Open Source world around the same time and it never received much uptake there and only one contribution of literal code (plenty of feedback). I depended on an early library that was created called FlickrNet. I contributed a few small fixes during my development of Flickr4Writer to the cause. This has been a very popular library and I think even used in some close-to-official Flickr apps for the Windows platform. It served my purpose fine for a LONG time…until 2 days ago. Because Flickr4Writer was pretty much complete and ‘bug-free’ for the mainstream cases, it hadn’t been touched in years and there was never any need. I felt no need to fiddle with code at all that didn’t need to be messed with. Another factor also was that Live Writer plugins are pretty locked on .NET 2.0 for loading, so there was no real incentive for me to move to anything else. Two days ago I started getting emails that Flickr4Writer was not working anymore. One writer sent me a very kind note detailing what he felt the problem was due to the recent API changes required by Flickr. One 27-June-2014 the Flickr API went SSL-only and pretty much all my code broke. Well, to be true, the version of FlickrNet I was using no longer worked. It was time for me to update. Run the new installer for Flickr4Writer by downloading it here. Step #5 should launch the authentication flow again to get new tokens. This worked for a set of folks and a few tests I did on my machines. Performing the re-authentication is key to get the updated tokens for the API usage for this plugin. I apologize about making folks uninstall/re-install but the installer code was one thing that was really old and I just didn’t want to spend too much time getting that working so I just created a new one. I’m really glad people find Flickr4Writer useful still and I apologize for not having an update sooner (I actually didn’t get the notice that Flickr indicates was sent out…probably in my spam somewhere) but I appreciate those users who alerted me to the problem quickly!